This Aware Appreciation process is doing just what it’s designed to do. I am noticing all sorts of things that are worthy of appreciation. Several of the things on my list today serve multiple purposes…sort of like the Swiss Army Knife. I had to wonder if the Swiss Army Knife was really a Swiss invention. The Swiss Army Knife has amazing utility. 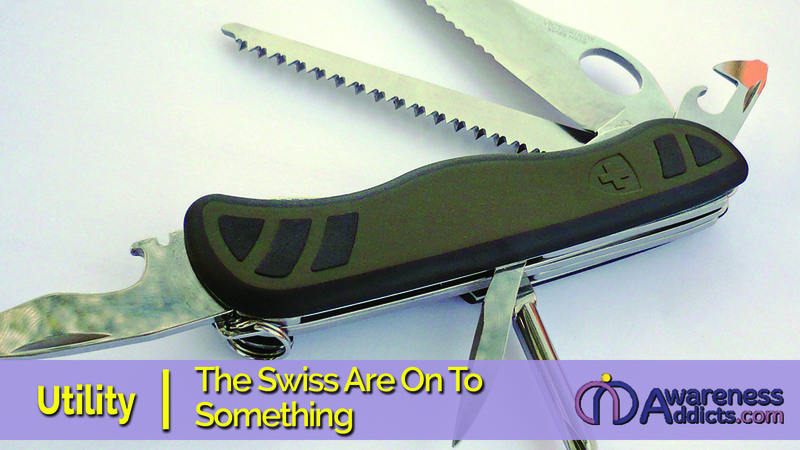 During the late 1880s, the Swiss Army decided to purchase a new folding pocket knife for their soldiers. This knife was to be suitable for use by the army in opening canned food and disassembling the Swiss service rifle which required a screwdriver for assembly. So, the knife is a Swiss invention but it was first manufactured in Germany. Most of us carried one of these nifty devices until the increased airport security started confiscating them when we neglected to take them out of carry-on bags prior to screening. Now, the Swiss Army Knife is rarely handy when I need it. That doesn’t keep me from appreciating it or any of the other multi-use things I noticed today. Actually calling this machine a printer is a bit of an insult. I do primarily use it for printing but it stands ready to copy, scan or fax as well. And, it does all of this with a very small footprint. I recall a day not that long ago when we had 4 different machines (all of which were much larger) to handle these tasks. The machine is technologically amazing. You may recall I have been in the midst of a remodeling project. I love poking around in home improvement stores. At this point, I’m ready for a break. Thank goodness we’re almost done. There have been several issues that have come up (primarily plumbing or electrical related) that have found me at the home improvement store seeking help to find a splitter that would solve the problem. These nifty devices come in all shapes and sizes. Who knew? Without these splitters, we would end up with a whole lot of duplication. Splitters provide an amazingly efficient way to solve many problems. I am writing this today from my closet office. I converted a walk-in closet that was designed for extra storage to an office at our second home. I needed a comfortable place to work. It’s compact but it does the job. Our primary home does not have walk-in closets. It is one of the things I have most missed while living there. I dream of having a closet again where I can see all my options at the same time. The walk-in closet is an amazing architectural improvement. Did this inspire you to notice things in your life that have versatile utility? What’s your “Swiss Army Knife” example? Please share below and complete the sign-up form at the right. Appreciation is a powerful tool that helps us create more of what we say we want in our lives. You can practice Aware Appreciation along with me by signing up to receive daily reminders.